There's no better way to enjoy wild birds in their natural environment than saying hello to them with both barrels of a shotgun. Its a beautiful thing to see a bird in flight ripped to pieces by hundreds of pieces of high velocity lead shot. But sometimes you don't quite manage to finish the little buggers off. In such circumstances there is only one thing the humane, kind, caring bird killer can do - finish your feathered pal off promptly by clubbing the remaining life out of it with your walking stick. And this is exactly what our caring Queen was photographed doing. Reportedly it took our ailing monarch some 5 whacks to despatch the little blighter, but her persistence paid off. What a lovely lady, an inspiration to all of us who enjoy killing animals for fun (without them suffering too much, naturally). 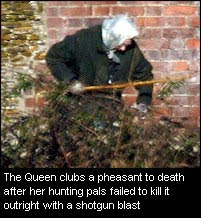 Some would say that such behaviour was inappropriate for our head of state, especially as HM the Queen is also patron of the RSPB - The Royal Society for the Protection of Birds. But no, apparently the best way to protect birds is by firing at them whilst shouting "hoorah" with your inbred friends. As a tribute to our Queen, and her absolute hypocrisy, we've decided to appoint her Royal Patron of ThroneOut. We are honoured that a woman, whose views and position might initially appear to be contrary to the aims of ThroneOut, should so courteously permit us to use her name on our letterhead, alongside our other great Patrons, Diana "Princess of People's Hearts" (and shagger of arab heart surgeons), and of course our first patron, King Charles I. A historical thesis, explored in a recent television documentary, suggests that Edward IV, who reigned from 1461 to 1483, was conceived when his parents were 160 kilometres apart. His "father", Richard Duke of York, was fighting the French at Pontoise, near Paris, while his mother, Lady Cicely Neville, was at court in Rouen. She was said to be spending much of her time in the company of a local archer with whom she was rumoured to be having an affair. Since the evidence suggests that Edward IV was hence illegitimate (and therefore not the real son of the King), he and his heirs would have no claim to the throne. Instead, the succession should have followed a different line leading to Michael Abney-Hastings, a forklift truck driver in Australia. Yet again, the more you dig, the more you find royals bed hopping and sprog popping with people they shouldn't. This only lends weight to ThroneOut's call for the Windsors to be DNA tested. Who knows how many of them have no claim to the large amounts of tax payers' money they help themselves to? Of course, if this research is right, none of them do. ThroneOut has previously reported how Diana had claimed that a "senior royal" was planning to kill her in a car accident. The Mirror Newspaper has now confirmed that the letter she wrote accuses Prince Charles of planning her death. Diana was killed in a car accident later that year. Diana was apparently convinced that she would be killed and had famously collated evidence of wrongdoing by Prince Charles which she apparently intended to use in any battle with him over the custody of her sons. There was also claimed to be unease in high places about the extent of her relationship with Dodi Fayed who would have been step father to the future King had Diana and Dodi married. 5) Numerous documented inconsistencies with the official version of events both before and after the accident. No doubt Mr Plod will conclude that there is nothing suspicious at all. Afterall, why let a jury see the evidence, when you can let one copper who has pledged allegiance to the Queen decide that for you? "Nothing for you to see here folks, move along."